From horrific self-portraits to examinations of the Holocaust to pop art depictions of Hollywood's famous, the work of the Vienna-born artist never fails to provoke. To this end, Helnwein often places contemporary images in his historical contexts to raise chilling questions about human nature and faith. In his work, "Epiphanie," for example, the Madonna holds not just any baby but an infant Adolf Hitler, and they stand enclosed by a ring of Nazi SS officers. In the original painting, a grown Hitler stood in place of the Madonna and child. "I want to blow up [my work] 20x30 meters and put it in the center of the street, out of the galleries," Helnwein says. "This is my dream - confronting on the street people who don't care about artwork." His work has already taken off in this direction. In celebration of the 1994 Vienna Film Festival, he displayed a 25x16 meter picture of Arnold Schwarzenegger from a building in the center of the city. 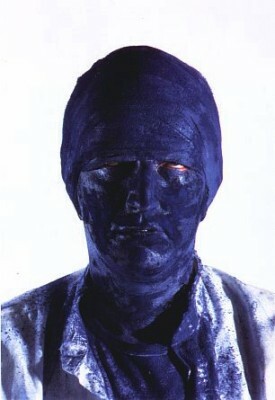 Instead of portraying the cardboard macho image available ad nauseum in his films, the Austrian-born actor's features are humanized by hues of an electrifying cobalt blue. "I used the abstract form to get close to the essence, to the feeling of the work," says Helnwein. Ironically, Helnwein says the work, when it was first shown in 1988 on a bridge near Cologne, the Berlin suburb where Helnwein makes his home, was vandalized, and the selected portraits that hang today outside the museum still bear the uninvited scars. "It was almost impossible as an artist to avoid [the Holocaust]," says Helnwein, whose work often deals with Germany's recent past. "our natural reaction is to forget. We're talented at forgetting, and it's the terrible artists who force people to remember. When you forget, it will happen again." Far from the chaotic world of pain and suffering, Helnwein also has tackled the glossy world of Hollywood's famous. There people have "meaning to millions, and I always wanted to know why," he says. The works - larger portraits of pop idols such as James Dean, Marilyn Monroe, Michael Jackson - have been compared to the art of Andy Warhol, for whom Helnwein posed. But Helnwein says there's a big difference: "Warhol was interested in the surface, in the camera. All of the images look pretty much the same. I was interested in looking under the surface, to connect to the beings behind, which was often totally artificial." Nevertheless, Helnwein does not mind the comparison. "What is important for my art is quoting things," he says. At the end of the 20th century, "it's the right thing to use the achievements of other artists." For example, in realizing "Epiphanie," he refigured the original photograph on the computer, enlarged it to 2x3 meters and painted it with acrylic and oils using the techniques of the old masters. "I use all the technologies of the time of the Renaissance up to modern times," Helnwein says. Aside from his many short stints throughout Europe and the United States, he spent seven consecutive months in the U.S. in 1977. "It's impossible not to be influenced by it. I saw James Dean, Elvis, Mickey, Donald Duck, music, blue jeans. Everything that amazed me was American. The whole world was overwhelmed and taken by this world." Helnwein will travel eventually to the six countries where his work will be shown and regards this as "a chance to see things differently." "I don't want to give up my European heritage," he says, but, "it's a chance for a new type of art."